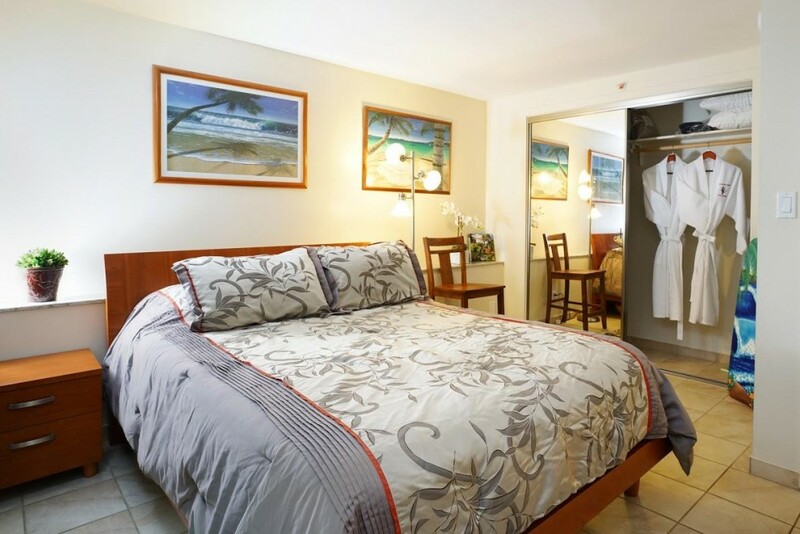 Suite 102 is a one bedroom suite that accommodates four guests located at the Makai ocean end of the building away from the street noise offering a relaxing environment with the sound of the ocean waves crashing on the beach and the refreshing cool tropical tradewinds. Located on the first level this suite has the more generous lanai outdoor living space to enjoy your meals al fresco, morning coffee or late night drinks. The Wet Bar Kitchenette includes a fridge, tableware and additional pantry items (coffee maker, toaster, rice steamer, tea pot). The “Dining Nook” pub table is adjustable to accommodate your needs, comfortable for eating and also as a computer work station. Complimentary items in the suite include snorkel gear, tennis racquets and beach towels (items are offered upon availability for use during your stay). The Master bedroom offers a Trump Serta queen mattress bed and the living room a queen sized sofa sleeper. Two HD TV's are in the suite with cable service, WiFi internet access and HDMi/LAN line for high-speed connections and video streaming from your laptop. Cleaning supplies and utensils are available for your use to help keep the Suite fresh and sanitary. The building offers coin laundry (iron & board are in the suite), ice machine and surfboard / bicycle storage. The grounds are well landscaped with lounge chairs on the grassy courtyard and tables on the patio. A courtesy phone is located in the main lobby area (808-921-8262) along with a restroom and lobby seating. Parking is available free along Kalakaua Avenue and metered on the Kapiolani Park side, please read all signs carefully. Metered parking is $1 per hour from the hours of 10 am to 6pm with free parking from 6pm to 10am. Parking can also be arranged within the building for an additional fee through the management agency, reservations are encouraged prior to arrival. Parking is always tight during parades, festivals and events at Kapiolani Park, please be aware and plan accordingly. The Gold Coast is a serene exclusive neighborhood located on the edge of Waikiki at the base of Diamond Head, a picturesque residential area of luxurious high-end dwellings with a small mix of hotel use. Close enough to enjoy all that Waikiki has to offer but far enough away to feel the relaxed atmosphere of a tropical paradise vacation. Some key activities within walking distance include the Waikiki Aquarium, Honolulu Zoo and Kapiolani Park. With its many activities and festivals the park has much to offer. There are two Tennis Court areas so bring the complimentary tennis racquets. One area is lighted for evening play and the other boasts 10 courts. Within the park is the Waikiki Shell Amphitheater, check the schedule for concerts and performances. The Outrigger Canoe Club is on Kalakaua along with the Elk’s Lodge. Although exclusive private clubs for members, the Gold Coast residents have such warm Aloha you just might find yourself invited as a guest for dinner or drinks and pupus on the breath taking lanai. Take a brisk walk up Diamond Head Road past the lighthouse (bring some leftover popcorn for the chickens), stop at the majestic lookouts and search the vast horizon for whales, watch in awe at the acrobatic kite surfers and sailboards as they flip through the air at this well-known surf spot. It is also common to see hang gliders and paragliders soaring over the edge of Diamond Head, a spectacular sight. There is also a path to access the beach area, step carefully. Make your way up to the Diamond Head State Monument and take the hike to the top for even more panoramic spectacular views. Ride thebus! Yes, everyone in Waikiki takes “thebus”, don't be shy, especially if you plan to enjoy a Mai Tai or two. There are so many advantages, skip parking, convenient, goes to just about every place you want to be. There is just too much information to list, check out the website for details and download the app. Key points to note, the bus stop is conveniently located outside of the building to the left #14,19,20,22. Don't forget to grab the paper transfer slip. #19 and #20 will bring you all the way from the airport to the condo. Use the Google maps tool to plot your course to popular destinations throughout Waikiki and the Island like the Waikiki Library, Waikiki Golf Course, Safeway, Kapahulu restaurants and shops. Head east to Kahala Mall, Whole Foods, and for the adventurer all the way to Hanauma Bay, Sea Life Park and Makapu'u Light House hiking trail. The east side offers shopping, dining and sports activities with a local flare. There is also a costco there so don't forget your membership card. Aloha and enjoy your stay!